Jam Sebastian, half of the real life online sensation couple JaMich, is now hooked on life support. As posted by Mich Liggayu’s father, Jam’s situation had turned to worse and needed to be supported by a ventilator. Jam had been fighting Stage IV Lung Cancer at St. Luke’s Medical Center Global City. He was suppose to finish his last chemo session. According to Christopher Joseph Liggayu, Mich’s father, they were along EDSA on the way to Viva when they received an emergency call about Jam. They were fortunate that they were still in Guadalupe area. As he had recalled, it took him 10 minutes to reach the hospital as he had seemed to make their vehicle fly in haste. Upon arrival, Liggayu family saw Jam already hooked to life support and attended by doctors and nurses. In the same post, he then added a short prayer saying that they could not bare seeing Jam’s suffering any longer. He also added a message to Jam saying that his promise to marry his daughter Mich was quite enough already. He had treated Jam like a son since long time ago and he promised the young man to take care of his fiance. He had also shared to friends and fans that the all of them are currently at his bed side. He ended his post thanking everyone for prayer for Jam and the family. Last month, Jam’s family had shared his plead to consider mercy killing as he was already getting weak and tired with the treatment and pain. His family refused to give up the fight as they believed that his condition still has hope. Last week, a rumor about his death had circulated. To dismiss the rumor, Jam had posted a photo of him with all smiles and with arms raised in victory. It was a sudden news that he is now in critical condition. 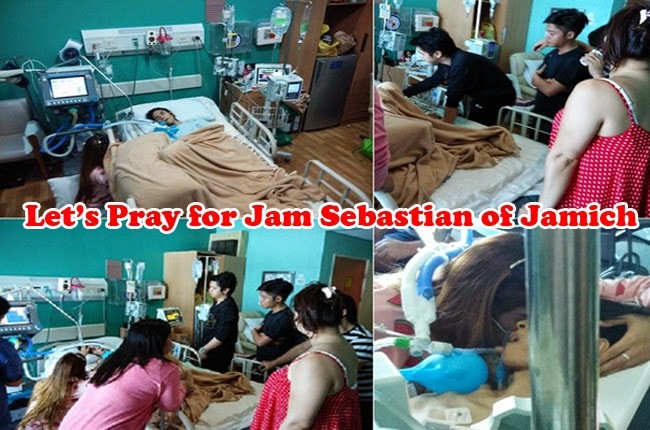 Jamich’s family and friends are continuing to pray for Jam’s condition.